Her shores feature some of the most remote and desolate beaches in Michigan. Her tributaries nurture some of the clearest and cleanest waters in the Midwest. One is a designated National Scenic River. Some of Her bays and islands are National Wildlife Refuges. Yet Michigan’s Lake Huron -- an emerald heaven of fabulous sunrises, pristine shoreline, and open water -- remains largely unexplored by paddle craft. Not that the Lake is ignored by boaters: on any given weekend, throughout most of the warmer months, a host of sailboats and cruising yachts make their way north and south in the deeper water of the open lake. but Lake Huron’s deeply serrated shoreline, it’s mild seasons, it’s protected waters, it’s offshore islands, and it’s abundance of wildlife and wild places make the Lake ideal sea kayak country. Sea kayaks are touring kayaks designed for long distance travel over open water. They are inherently sea worthy, thus earning their name. Being designed for rough conditions, they are capable of calmly running in harm’s way. They also are extremely efficient at leisurely cruising with a mellow, relaxed pace. Historically, the boats originated in West Greenland several centuries ago. The early native versions were assembled from sealskin with a fragile wood and bone frame, but today the boats are constructed of modern fiberglass. Sea kayaks are fitted with bulkheaded storage compartments and several hatches providing easy access to these spaces. Inside, the boats have plenty of storeroom to transport a paddler and enough gear and equipment for an extended two-week camping trip. Because of their versatility and practicality in exploring coastal waterways, these sleek water craft are becoming popular on Michigan’s Great Lakes. Without a doubt, the finest sea kayaking opportunities in Michigan’s lower peninsula occur in the Alpena - Rogers City area. This paddler’s paradise begins at the south end of Thunder Bay. At the remote Negwegon Wilderness State Park, near Black River, a chain of islands begins to appear offshore. From the Negwegon parking lot, paddlers enjoy a remote cruise along 6.5 miles of undeveloped coastline. The rocky shoreline and hidden sandy bays lead to a geographic location known as South Point. Bird Island, located one mile offshore, and Scarecrow Island, located three miles offshore, are designated wildlife refuges. They are inhabited by rookeries of nesting colonial water birds and it is illegal to go ashore on the islands. Four miles offshore of the North Point of Thunder Bay, kayakers can visit a cluster of several islands. The largest, Thunder Bay Island, is occupied by an abandoned lighthouse. Beginning service in 1832, it is the 5th oldest lighthouse on the Great Lakes. Thunder Bay Island has an interesting history. Long ago it was home to a fishing village of 160 people at a time when the city of Alpena had yet to be founded on the adjacent mainland. 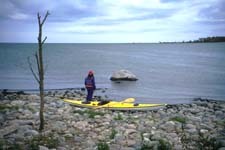 Several miles further north, paddlers visit an old quarry site known as Rockport. Two miles offshore from this site is the charming Middle Island. The west side of the island is home to an abandoned U.S. Lifesaving Station. Established in 1881, and in service until 1937, the ruins of the buildings still remain. In the small bay directly in front of the old station is the wreck of the Portsmith. The 176-foot ship, loaded with pig iron, ran aground on the island shoals in 1867. The intact stern section is easily viewed from the cockpit of a kayak. On the east side of the island is the Middle Island lighthouse, which was constructed in 1905, and is presently being restored. Much of Middle Island is privately owned, so if you want to explore the landscape, or examine the buildings, you will need to get permission from the owners. Please respect their property rights, and call Marv or Joy Theut (989) 595-6722 -or- (989) 595-3600 to ask permission to land on their portion of the island. Traveling north, to Presque Isle, kayakers enjoy stopping at the beautiful peninsula and visiting the two historic old lighthouses which occupy that point of land. The “old” lighthouse was built in 1840 near the base of the peninsula, but trees grew tall and began to obstruct the light, so a “new” lighthouse was built near the end of the peninsula in 1870. With a tower 113 feet high, it is the tallest lighthouse structure on the Great Lakes. From Presque Isle, a 5-mile cruise across North Bay directs the kayaker toward Thompson’s Harbor. This area is an undeveloped Michigan Wilderness State Park, which features 8.3 miles of remote rocky coastline. The shoreline at the south edge of the park boundary is comprised of a large mile-long sand dune. The state park has the best assortment of wildflowers in Northeastern Michigan. A bountiful number of rare Orchids, Pitcher Plants, and Dwarf Lake Iris are commonly found here. Directly offshore of the Thompson Harbor, submerged on the lake bottom, lies the intact hull of the American Union, a 500-ton 180’ schooner which sank in 1894. On a calm sunny day, the wreck is visible from the cockpit of a kayak. Because of the snaggletoothed rocky reefs and shoals around the many islands and land points, the area from Thunder Bay Island to Presque Isle is one of the more dangerous stretches of water on the Great Lakes, and is respectfully known as “Lake Huron’s Shipwreck Alley”. 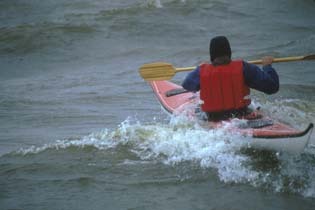 Rounding Observatory Point, kayakers can look forward to a 7-mile paddle along uninhabited coastline as they continue north to Rogers City. This stretch of rocky shoreline has no access by land, so it is remote, and a beach walker’s paradise. Centuries of flotsam and interesting fossils are found amongst the tiers of ancient limestone beach cobble. Somewhere along this route, the kayaker will suddenly hear a huddled group of voices floating like disembodied souls. The enchanting cry of the common loon is often the only sound to greet Lake Huron’s coastal kayakers. -- Our did you actually hear the haunting wails from the spirits of a forgotten shipwreck? Go and discover. The solitude and tranquility of Lake Huron’s secret coastline is the best kept secret in Michigan.